Homey don’t play ‘dat…Etiquette 101 for the clearly clueless. I don’t think I would be up against much opposition if I were to claim that people are getting ruder and ruder as time goes on. As a whole, we’re less patient, we see more planes being grounded due to ridiculous outbursts from unruly and inconsiderate passengers, witness unprovoked viciousness on social media. A general lack of refinement is rampant, and it disgusts me to no end. I think one of the things that draws me to that mid-century period among a million other reasons, is that etiquette was more often than not observed. People actually went to classes and learned about proper etiquette – and imagine this: they put it into practice! These days, I am reminded how much of that has gone away – just as so many other wonderful mid-century standards; buildings, cars, furniture – have all been trashed to make way for the new, which is not always better. Craigslist and Etsy, and some of the people on those platforms have been really testing my patience as of late. I spend a lot of time running quotes for people who “JUST HAVE TO HAVE IT!” and then don’t ever respond to my quote. (The quote they’ve requested that is often less than what I had on the listing to begin with.) That’s the nature of the business…and to some extent, I can understand deciding not to purchase something – it’s the lack of response or disregard for my time that gets to me. Today, I was let down yet again after spending time working with a buyer who wanted to purchase my Brown Saltman Dining Set. She’d seen it on Craigslist, and Etsy, and had been watching it on Ebay – I know this, because she emailed me to tell me so, and that she’d been “lusting” after it, but it was above her budget. Since it hadn’t sold in the two weeks she’d been watching, she’d decided to give me a low-ball offer. Between emails and texts, I could see she was serious about her interest. Being motivated, and less than a week away from delivering my son, I decided, “why the hell not?” It was less than I was wanting to accept, but if it meant clearing out my living room before baby – well, I’d just give her the deal and everyone would win. We agreed on price, discussed whether it would fit in her SUV, and decided on a date and time she would be driving down from Claremont (over an hour away) and I cleared my schedule to be available to this person coming from so far. I don’t know about you, but I’m not driving over an hour for anything I’m not sure I want. Then two days after we settle on these details, my beautiful set gets featured on an Etsy “Treasury.” For those of you not on Etsy 1.you should be, and 2. a treasury can really help to boost your sales. Most Etsy users have “followers.” These followers see what that user “favorites,” or adds to a “treasury” (a/k/a a collection of beautiful pieces with some theme to it). When one of your pieces is selected for a treasury, your views on that item can soar. And so did my Brown Saltman Set, as it was featured on a popular treasury on Thursday. Noticing the peaked performance and increase in views, keeping my “buyer” in mind, I asked her Friday to confirm for me that she would still be coming, and still wanted the set so that I may reserve the item for her online. (Reserve meaning mark the piece reserved so that no one else would buy it out from under her…..and her low ball offer…..God, I’m too nice.) She assured me she did want it, and would still be coming on Saturday. Did I say that? Of course not. I did dishes as they took their time. Then much to my surprise, the buyer hollered for me, and offered a hand shake. “Thank you, but we’re going to pass. It doesn’t fit our needs.” Fit your needs? 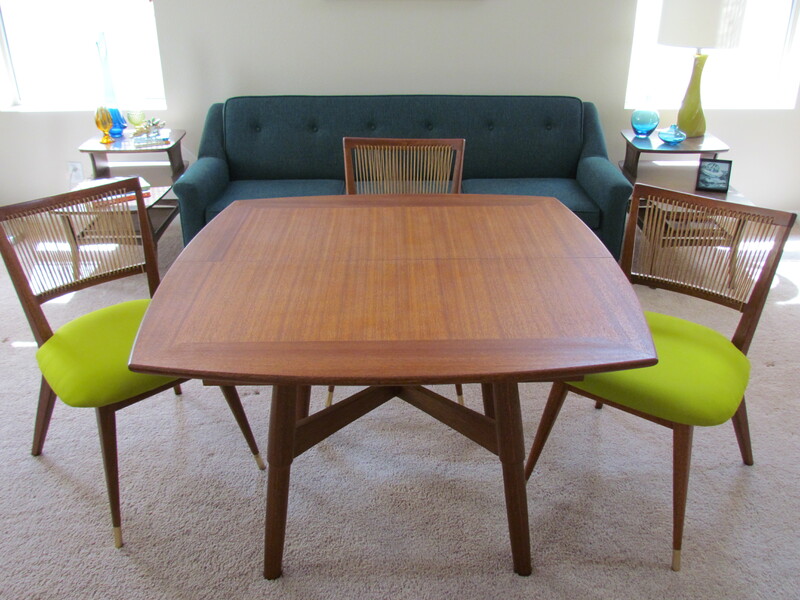 It’s a dining table and chairs….What exactly did you think it would do? You had dimensions, detailed photographs, and an exhaustive list of what had been done, and you insisted you had to have it. I reserved the item for you after re-confirming that you were still coming to pick it up, and all of a sudden it doesn’t fit your needs? I fart in your general direction. Are you kidding me? What a huge waste of my time and effort. What a huge waste of your own time. Unbelievable, really. So here’s a very simple lesson in etiquette when dealing with Craigslist and Etsy or Ebay, for that matter. Be upfront and honest about your needs. If you’re not sure, just say so. Don’t insist you’re going to buy something if you really aren’t sure. Feel free to ask questions, but be sure to respond in kind. If you ask for a quote, take a moment to say, “Yeah, thanks but no thanks….I decided not to go ahead.” At least then, you’re not leaving anyone hanging. Ask your husband BEFORE requesting the seller jump through hoops. It’s really annoying to answer questions, send more pictures, run shipping quotes, etc. etc. only to hear your husband doesn’t like it. If I asked my husband to like everything I bought, we’d be sitting on the floor in a house with empty walls, eating with our hands and wiping our asses with old sponges. (But there would be t.v.). Say thank you. “Thank you for your time.” It doesn’t take much. This goes for just about anything. Let people know you appreciate the time they’ve spent. If you’re a seller….beware. Flakes are among us-and they shop on Craigslist. The world is rife with people who say they’re going to do something, then disappear into thin air. Despite this, always be kind, and take vacations – because you will need them. Don’t count your chickens until they hatch. Be honest yourself, and hopefully more often than not, you’ll deal with delightful buyers. They are out there too-and if you maintain your integrity, they will find you. I feel better already. Thank you for your time and thank you for reading my post. I hope this was not your last blog post because I really enjoyed your story! This is exactly what I’ve been going through! In the old days, it was mostly Craigslist buyers who pulled my chain. They’d make a low-ball offer and I’d agonize over it and finally think, ah, bird in hand, I need the room… and accept it. And then I’d never hear from them again. Or they’d made an appointment to come and never show up. Or even have the decency to call and make up some kind of excuse. I’d wait and wait and wait, afraid to leave the house because they were going to arrive any minute. 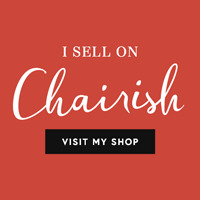 Now that I’ve recently opened up my shop on Etsy–www.MadGirlRetro.etsy.com–I’ve been getting people who waste my time getting them shipping quotes because most of my buyers are from out of state. It’s time consuming! First of all, I tell them what I think it’s going to be. Then when they okay that, I start an auction on U-Ship and/or contact a couple of private shipping companies for quotes. There is usually back and forth with questions about things like stairs and the buyer’s availability to accept delivery. Finally, I get some rock solid quotes and low and behold, the buyer is suddenly MIA. Not only did I waste my time, but the shippers’ time. I contact them all and say, “Sorry, the buyer who absolutely had to have this piece has disappeared. I suspect she is dead because nothing else would have kept her from it, she loved it so much.” This is the drawback of online selling. At least with a brick-and-mortar store, they come in, they buy it or not. You don’t start a “relationship” with them. At any rate, I’m glad to know I’m not alone!